If you have some fresh shrimp, just make this - it's easy to put together and isdelicious. PREHEAT oven to 400 degrees. You may also fry these in oil if you wish. Thaw shrimp, if frozen. Peel and de-vein shrimp, leaving tails intact. Rinse shrimp; pat dry. Set aside. For sauce, in a small bowl stir together mayonnaise or salad dressing, apricot preserves and curry powder. Cover and chill until ready to serve. Spread the oil on the bottom of a 15x10x1-inch baking pan; set pan aside. In a large shallow dish combine the coconut, cornstarch, sugar, and salt. In another small shallow dish place the egg whites. 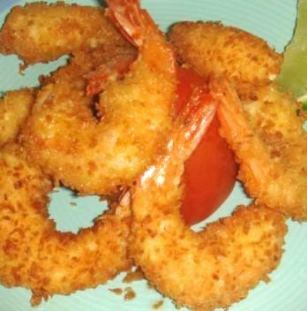 Dip shrimp into the egg whites; coat shrimp with coconut mixture, pressing the mixture firmly onto the shrimp. Arrange shrimp in prepared pan. Bake about 10 minutes or until shrimp are opaque and coconut is golden, turning once. Serve with the curried apricot sauce.